In October of 2013, Bret Bohn took Prednisone, which had been prescribed to him for nasal polyps. Prednisone is a steroid known to make people crazy by preventing them from sleeping, and he indeed was unable to sleep and came into the Providence Hospital Emergency Room. There he was given a combination of Ativan and Ambien, both central nervous system depressants (downers) and sent home. He then suffered a seizure and was taken back to Providence. He had given a power of attorney to his parents, but when Providence didn't like their decisions, it got the State agency called Adult Protective Services to secretly get a court order giving the state temporary guardianship even though the statute provides that someone designated by the individual is normally to be given priority. There is a state agency, called the Office of Public Advocacy (OPA), which is supposed to be the guardian of last resort, and it was given guardianship in spite of the power of attorney given to Bret's parents. When a guardianship petition is filed, OPA is also appointed the attorney for the person against whom the petition is filed (the "respondent"). There is also a "court visitor" appointed who is supposed to give the court an independent evaluation. The court visitors are paid by OPA. When the court gave the state temporary guardianship, the OPA attorney is converted to a Guardian Ad Litem, who is supposed to speak for the respondent because he is unable or incompetent to speak for himself. Bret's parents filed to try and get their rights back, but the trial court refused, resulting in a petition to the Supreme Court to honor the power of attorney. The Supreme Court did not do that, but did note that Bret's parents were denied due process of law by not being notified and the trial court was inconsistent when it officially held that 'there are no other individuals who are willing to be appointed and act in the best interest of the respondent' yet in the same order it ruled that "[a ]ny powers of attorney currently in place are suspended pending further court action.' " The Alaska Supreme Court was "troubled" by any number of things that the Court had done. Providence also wanted to ship Bret to Johns Hopkins Medical Center in Baltimore, Maryland, on the grounds that they had no idea what was wrong with Bret, but that was stopped. There then followed a legal battle held behind closed doors resulting in a February 7, 2014, Order from the trial court granting full permanent guardianship to OPA. This Order states that Bret's mother had made threats against her son's life and makes her and Bret's father out to be crazy or worse for not trusting Providence. The Order is written in a way to support the decision to take away all of Bret's rights, ignore the power of attorney, and grant permanent guardianship to OPA. From my experience these are all common examples of the court being misled by the state and doctors, except for one thing, which is that Bret's parents' original lawyer, family friend Rhonda Butterfield, withdrew from the case on the grounds that she felt Bret's mother was going to harm Bret. This is a rare thing for a lawyer to do. Ms. Butterfield reported that her client had threatened to harm Bret and that she thought he would be better off dead. Bret's mother is also reported to have told an unnamed person that she wished she had shot him while she had the chance. Frankly, all of this doesn't ring true to me, other than perhaps a distraught mother saying distraught things that she had no intention of doing. Ms. Butterfield may have had no experience with guardianships and not know how deceitful Providence, Adult Protective Services and OPA often are. Bret's father's and mother's attorney issued a News Release, stating among other things, "Judge Marston actually found that Bret's mother intended to harm him—despite clear evidence to the contrary." However, I think (1) the Prednisone is highly likely to be the reason for Bret's inability to sleep, resulting in his psychosis/delirium that brought him in in the first place (2) there is a good chance Providence caused Bret's seizures with the combination Ambien/Ativan and maybe something else, and (3) Providence is trying to cover up its malpractice. In terms of the process, it is a completely stacked deck. Providence has a long-standing close relationship with Adult Protective Services, a state agency, and they regularly get it to file guardianship petitions against patients who do not agree to what Providence wants. In this case, maybe Bret was incapable of making decisions, but that doesn't mean the state should have been appointed the guardian. Providence also regularly works with OPA, another state agency, which is the Public Guardian, who will do what Providence wants in almost all cases, if not all cases, once it has been appointed guardian. Then, OPA is also appointed to represent the respondent. This is a clear conflict of interest. OPA says the two different parts of OPA are independent, but everything I have seen is that the part of OPA representing the person always goes along with OPA. OPA can claim that this is not the case, but all of these cases are conducted in secret so it is impossible for the public to know what is going on. Another thing that is very troubling to me is that we do not know what is currently going on with Bret, how truly unable he is to make decisions at this point, or say what he wants. The public docket sheet does show, however, that Bret tried to escape from the hospital on January 30th. Bret was transferred to Harborview in Seattle by his guardian in April, given Risperdal because he tried to escape and threatened with electroshock. However, he was able to get weaned off the drugs, recovered, and on June 17, 2014, the guardianship was terminated. 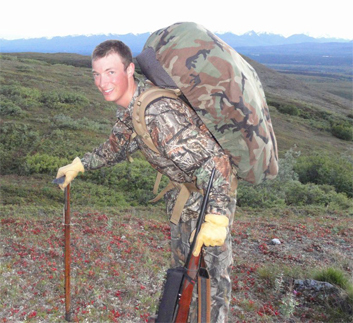 However, as a result of the guardianship, it appears this hunting guide is now prohibited from possessing a gun under federal law. PsychRights has asked the court to open its file to the public in March, which was denied in April and appealed in May, 2014. After the guardianship was terminated, PsychRights and Bret entered into a settlement agreement to have the file opened to the public. On August 14th, 2014, the Alaska Supreme Court Ordered the trial court to determine whether the file should be open to the public in light of the termination of the guardianship and the settlement agreement. The guardianship was terminated on June 17, 2014, and Mr. Bohn decided to have the court file opened to the public, which occured on September 23, 2014. However, subseqently, Mr. Bohn requested the file be closed again. Order from Supreme Court for Trial Court to hold hearing in light of termination of guardianship and agreement between Bret Bohn and PsychRights to open the file, August 18, 2014. Emergency Petition for Review by Glenn Bohn and Lorraine Phillips, December 24, 2013. Adult Protective Services Response to Emergency Petition for Review, December 26, 2013. Guardian Ad Litem (from the Office of Public Advocacy) Opposition to Emergency Petition for Review, December 26, 2013. Office of Public Advocacy (the Public Guardian) Opposition to Emergency Petition for Review, December 26, 2013. Providence Hospital's Opposition to Emergency Petition for Review, December 26, 2013. Supreme Court Order, December 26, 2013. Order on Petition for Review, January 15, 2014. Findings and Order of Temporary Guardianship, November 14, 2013. (This is the order the Alaska Supreme Court notes is inconsistent in holding that there was no one else willing to serve, yet at the same time invalidated the power of attorney given by Bret to his mother and father). Letters of Temporary Guardianship, November 14, 2013. Transcripts of November 14 and December 9, 2013, hearings. Order And Findings Granting The Appointment Of Full Guardianship Of Bret Bohn To The Office Of Public Advocacy, February 7, 2014. PsychRights' Request to Grant Access to the Court Proceedings, March 3, 2014. Adult Protective Services' Opposition to PsychRights Request to Grant Access to the Court Proceedings, April 4, 2014. Order Denying PsychRights' Request to Grant Access to the Court Proceedings, April 17, 2014 (not received until April 30th). Order Terminating Guardianship and Dismissing Case, June 17, 2014. Order Granting Public Access to the File, September 17, 2014. Order Opening File to Public, September 23, 2014. Letter from Wayne Anthony Ross (Bret's parents' attorney) to Providence's lawyer regarding visitation, March 11, 2014. Letter from Wayne Anthony Ross (Bret's parents' attorney) to Providence's lawyer regarding visitation, March 13, 2014. Medical Kidnap: It Happens to Adults Too, February 3, 2015, Medical Kidnap. 'He can be his own man again': Family of insomniac kept hospitalized under court orders for seven months celebrate as judge says state custody should be removed, Daily Mail (United Kingdom), June 15, 2014. Judge recommends guardianship terminated for Bret Bohn, man family said was hospitalized against his will, by Tegan Hanlon, Anchorage Daily News, June 14, 2014. Wasilla man in adult protective custody released from Seattle hospital, by Laurel Andrews, Alaska Dispatch/Anchorage Daily News, May 19, 2014. Mother of Bret Bohn faces kidnapping charges in medical custody battle, by Michelle Therriault Boots, Anchorage Daily News, April 28, 2014. How Alaskans can be forced medication against their Wishes, by Laurel Anderson, Alaska Dispatch. Interview with Jim Gottstein of PsychRights, Alaska Health Policy Report, March 14, 2014. His family claims he is being held against his will, but cannot transfer him to another hospital because he's under guardianship of the state, KTVA Channel 11, March 2, 2014. 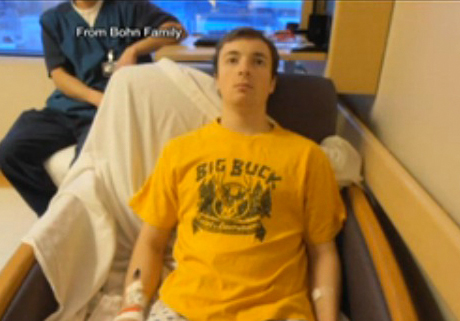 Patient rights vs. treatment: A complex question, KTVA Channel 11, February 28, 2014. Alaska family claims hospital is medicating son against his will, New York Daily News, February 28, 2014. Update: Bret Bohn Now a Ward of the State, Northern Light, February 27, 2014. Controversy surrounds hospitalization of Anchorage man taken into adult custody, Alaska Dispatch, February 27, 2014. Man’s medical condition leads to indefinite detention, forced medication, Police State USA, February 23, 2014. Press Release from Bret Bohn's parents' attorney, Wayne Anthony Ross, February 7, 2014. Man allegedly held against will at hospital Northern Light, January 14, 2014.